In my last post, I wrote about scale and everything was big, big, BIG! And I got to thinking. What about all the little guys??? That man mixes his leather and velvet like nobody’s business. I mean just LOOK at it – black leather and cognac leather in the SAME space? What??? He totally killed it. But notice how he places that large photograph over the sofa and yet to left he lets this teensy tinsy little picture just linger there. It’s all alone and yet it’s small scale and placement next to a much larger piece makes you want to run up to it, look it in the eye and punch it in the face. Genius. 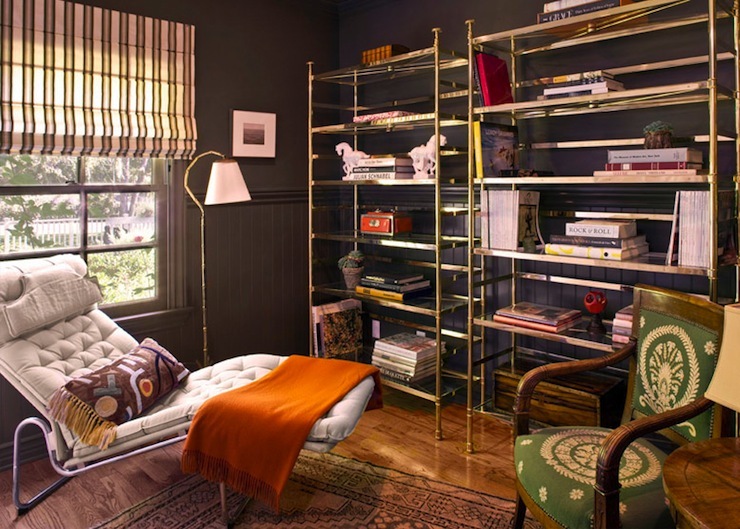 By the way, how much do you love those brass etageres against those black walls? 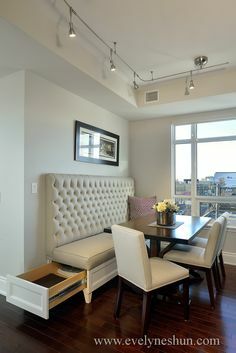 Is it chic and elegant, or trashy and horrible? And remember, art doesn’t have to live on the walls. 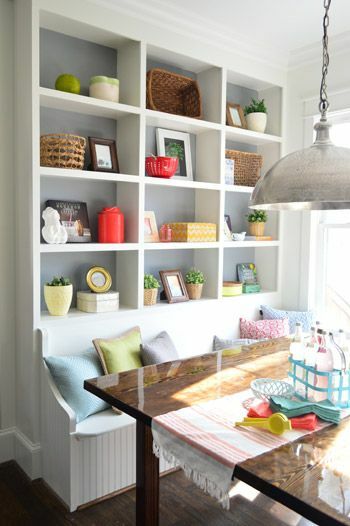 It can also serve as brilliant table-top accessory and bookshelf stuffery. Jot that down on a cocktail napkin, why don’t you. And don’t forget about table-topping. In this vignette, smaller pieces of art make an unusual contribution to a wonderfully eclectic grouping. So go–right now–and find a teeny tiny painting or a little bitty piece of sculpture and buy it. Do it. 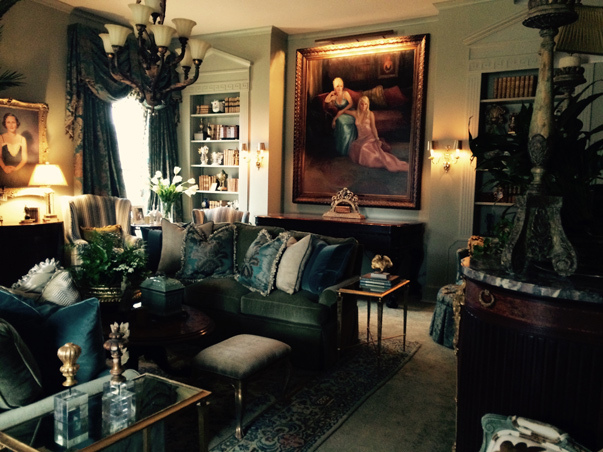 Last month I took you inside the luxurious plantation home of my present client. 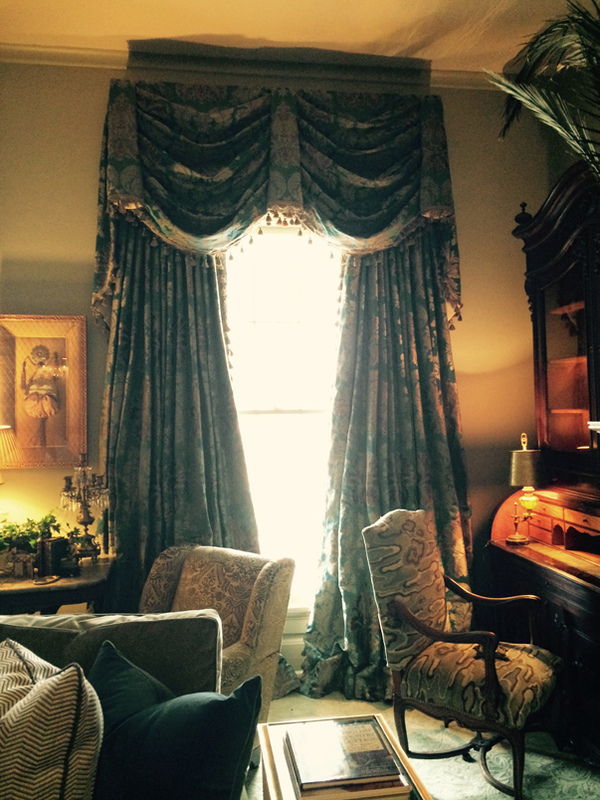 We discussed the drawing room and how we “grew” the view by installing draperies in a way to frame the windows. 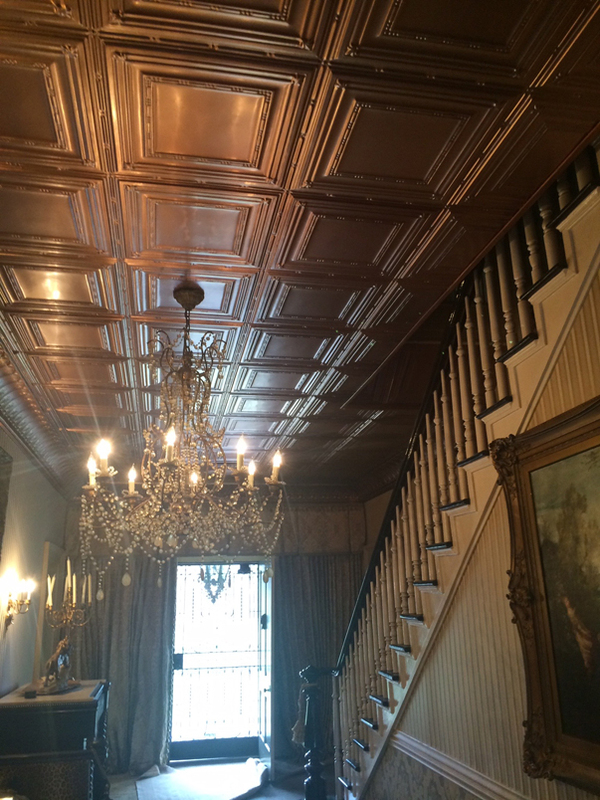 In the main entrance, or grand hall—which leads to the living quarters—we accented the height of the ceilings by installing coffered copper ceiling tiles with a custom crown molding, also from copper. 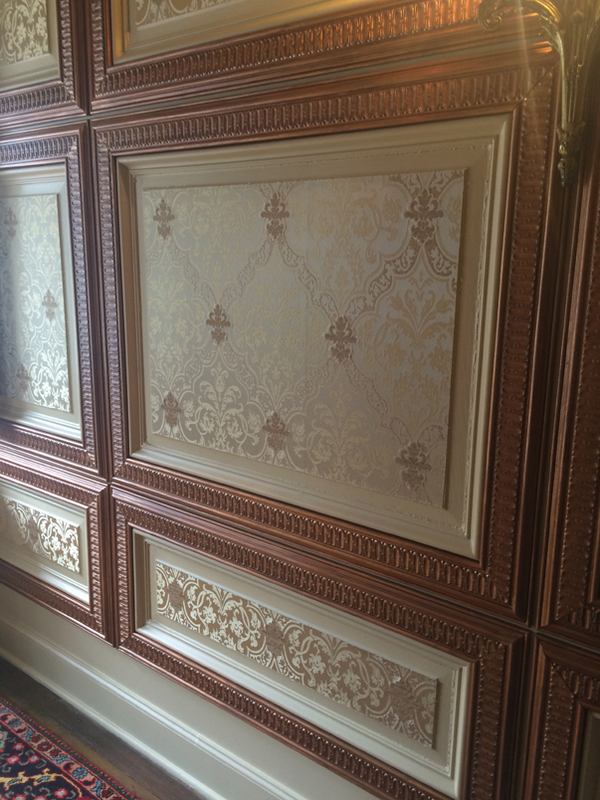 We added faux-finished library panels in a copper paint and installed a sensuous silk Damask by Lee Jofa within the framework. 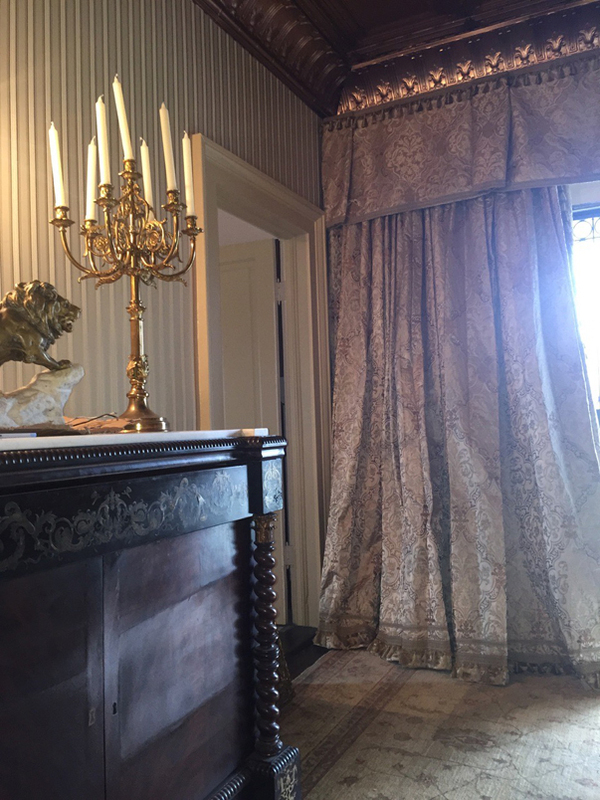 Then, using the same damask fabric, we balanced the entrance on the opposite end of the grand hall by using it on a custom drapery treatment installed directly below the copper crown molding. 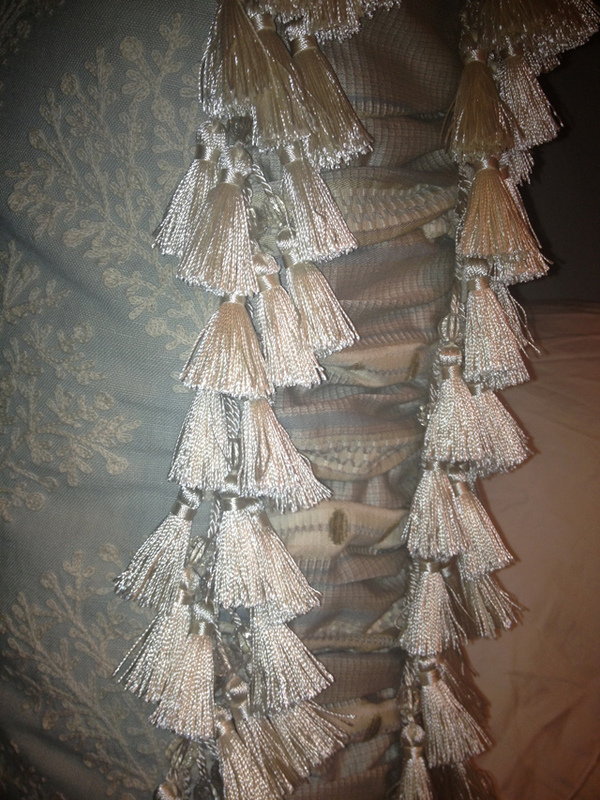 I wanted to add some depth to the draperies so I lined them with a complimentary silk stripe and added two bands of coordinating trim down the lead edge of the triple widths of fabric. 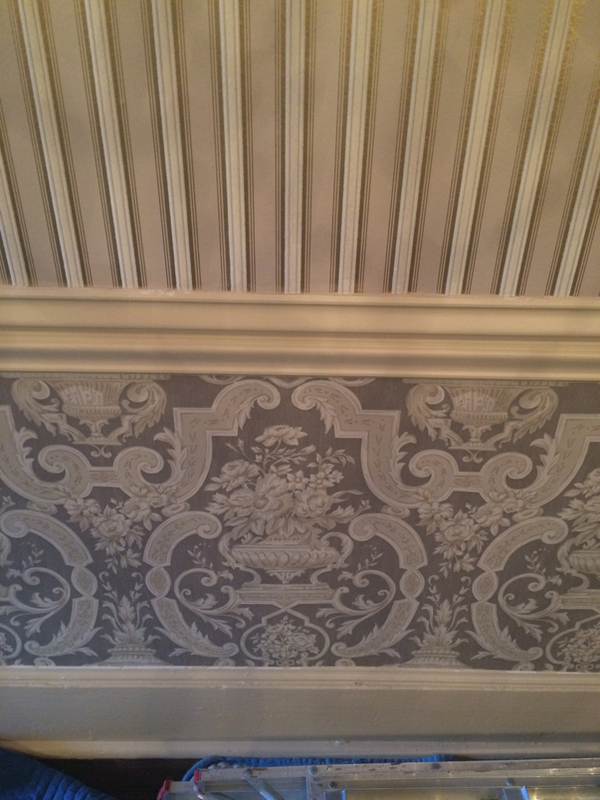 I also added the banding across the bottom of the valance treatment above the doorway. 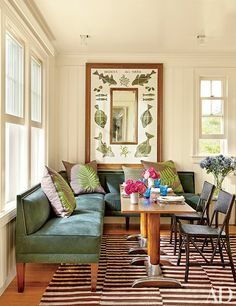 We added another layer of textiles by using a striped silk by Ralph Lauren on the walls above the chair railing down the main hall. 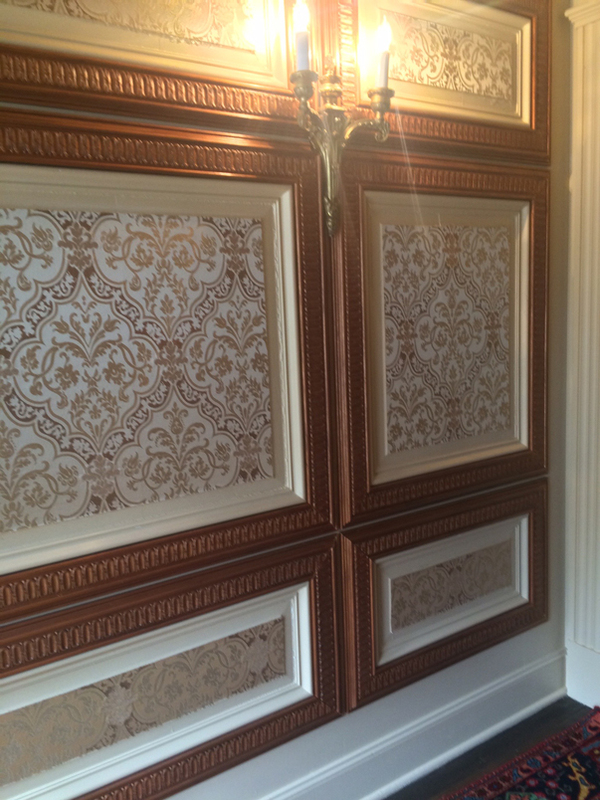 Below the chair rail, we applied an over-scaled Damask wallpaper by Osborne and Little. 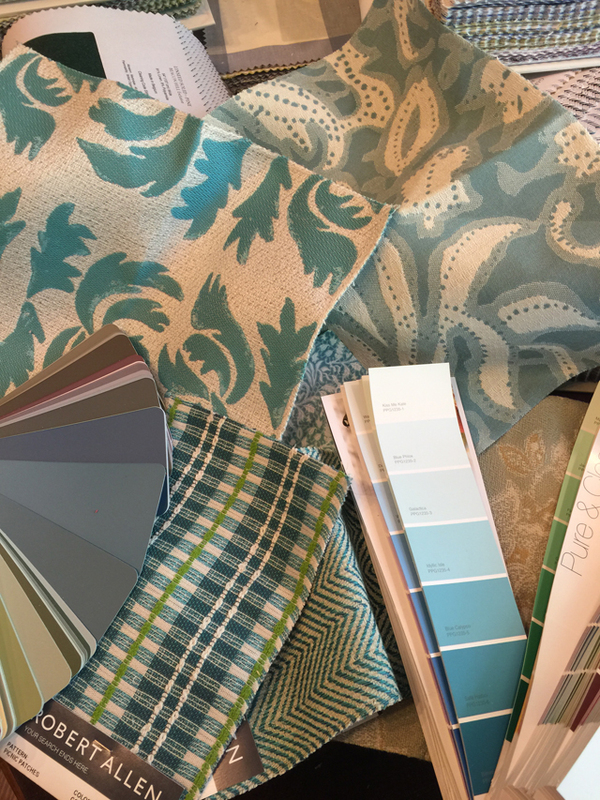 With such a lush variety of textures, textiles, and patterns coming together in one area you truly do create that feel of plantation living…à la Tara! 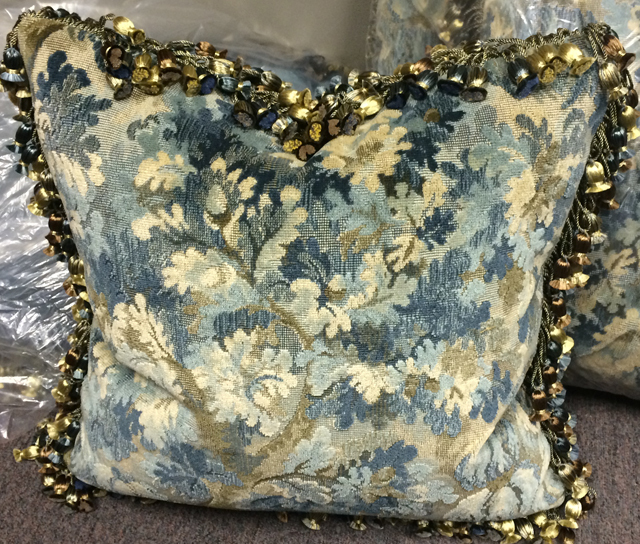 More textile talk coming next month! 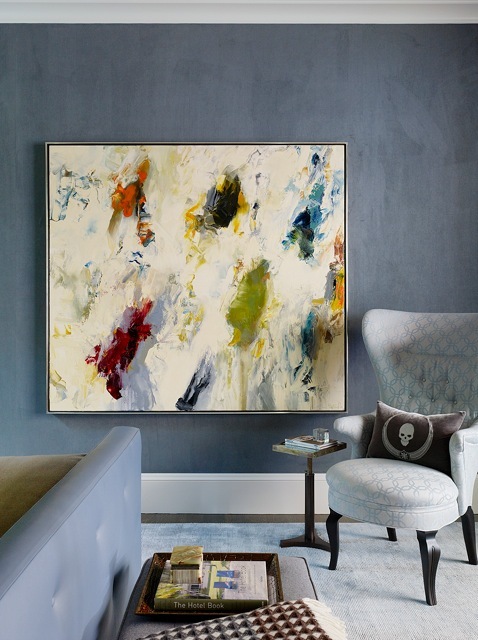 Large scale art—pieces sized anywhere from 4ft x 4ft on up to 6ft x 6ft and bigger. The bigger, the better. Big, big, BIG! (Size does matter in this case.) 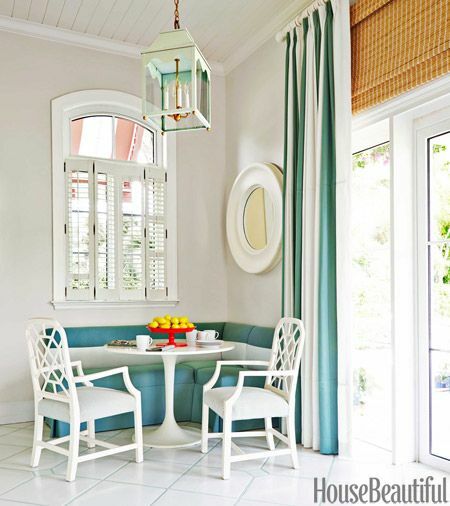 Scale is equally as important to a room as textile and color—maybe even more so. 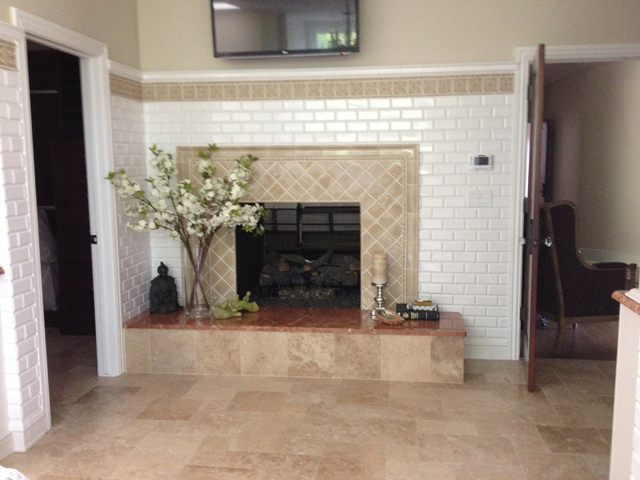 Maybe scale is the single most important factor governing a successful room design. Maybe. But more on what I think makes a room successful later. Back to art. BIG. ART. 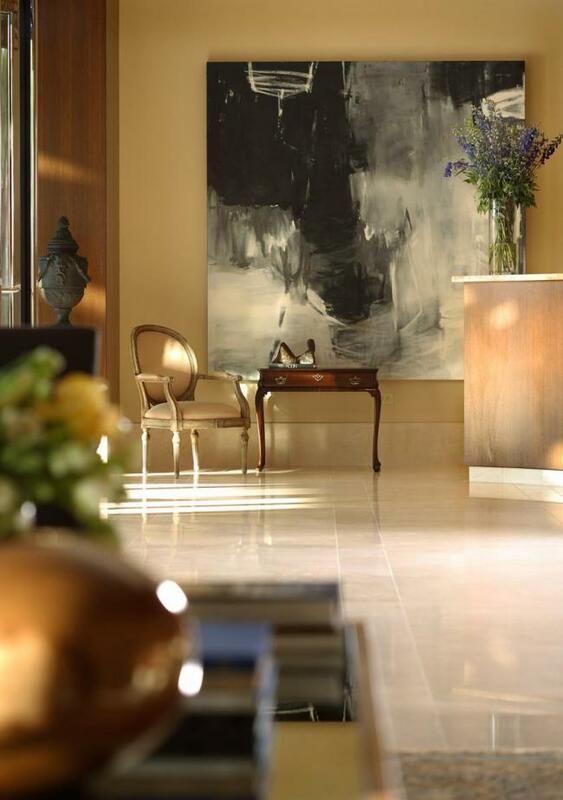 Place an over-scaled piece in an entryway and instantly you will signal drama and excitement. Or in a living room to establish conversational interest. 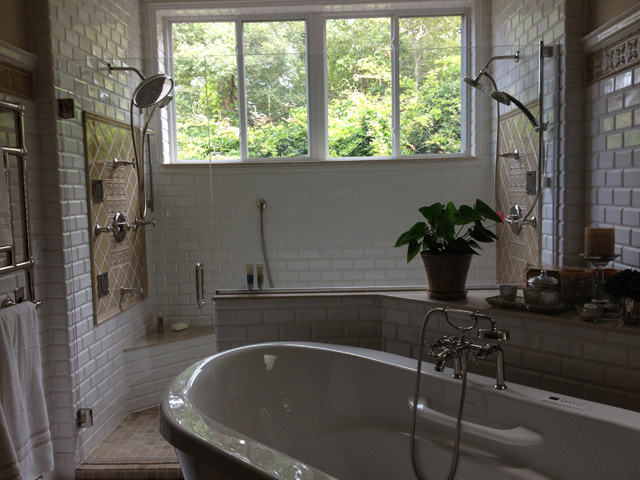 Or in an intimate space, such as a bedroom or private study for an enveloping sense of glamour and solidarity. Mankind needs an arena in which it’s safe to loose oneself. Art is that arena. We all need an environment in which we can feel safe in stepping out and away from the everyday, from the mundane. 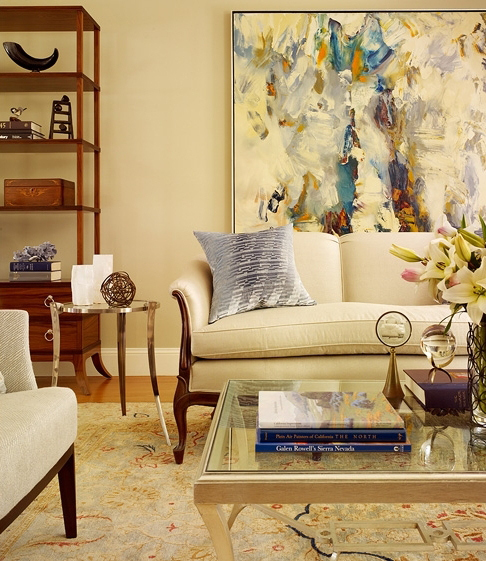 Art in the home helps us lean a little bit closer to inspiration and all that is beautiful. Wonderful art has the capacity to transcend the everyday and carry the viewer somewhere more extraordinary. And this factor is compounded by introducing large-scale works into a space. Art is a lifestyle. It is for sure my lifestyle. Collecting and surrounding myself with artworks. Someone once used the word “custodian” in regards to how I treat my home and its collection of art. And it’s true. Somehow I feel safe knowing that at the end of the day, I can come and be surrounded by beautiful things that I love. Oh, and also my family and friends. But they’re not as important. Stuff is more important. 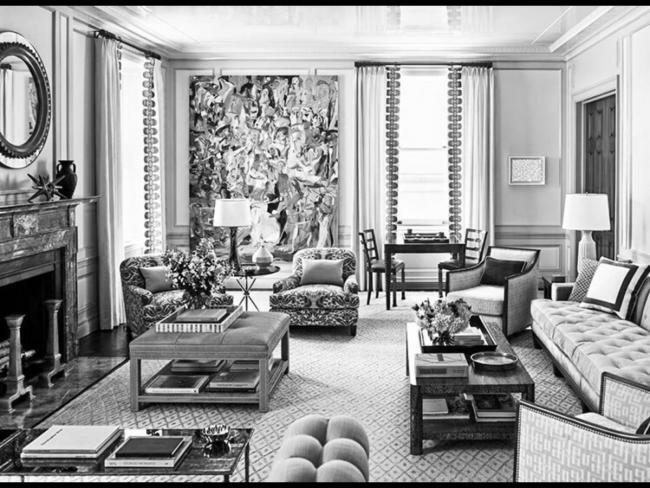 Notice how the furnishings are relatively normal in proportion to the rooms, however, the artworks command attention due to their size. Try to imagine these rooms with much smaller pieces and that commanding authority is lost. I’ve written previous blog posts on gallery wall installations, tightly connected groupings of smaller pieces, even a post on what I dubbed “humble art,” or artwork that you might find in a flea market or even DIY. And all of this has a valuable place in the home. But basically what I’m saying is that each home should have at least one large-scale piece of work, whether you buy it from a fancy gallery or make it yourself. 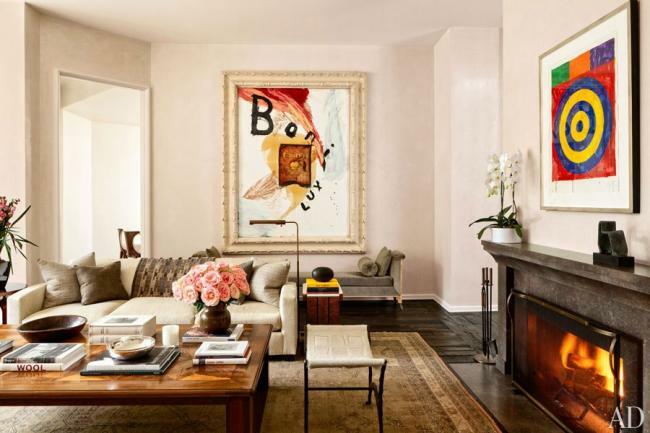 Proportionality and scale—and having fun with those elements in regards to your art placement—is key to elevating any space. It still packs a punch. 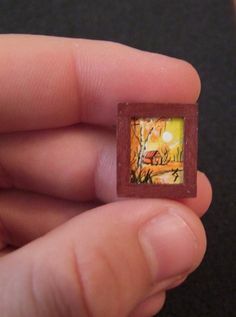 And how great is that teeny-tiny painting on the other side of the window??! It makes me grin it’s so good. That painting by the way is the work of Cecily Brown, an amazing New York-based artist. She carries on the tradition of the Abstract Expressionist master Willem de Kooning, currently an unhealthy obsession of mine. I’m obsessed in the sense that I cry a little bit everyday over how I can’t afford his work. He’s dead, so pretty much each of his paintings is worth about a trillion gazillion dollars. Note: after you die, your work is MUCH more valuable. Write that down. Anyways. De Kooning. Look him up. Buy a book. If you haven’t, you need to. If you’re not interested, then you should be. And if you’re still not into his work, then shame on you. 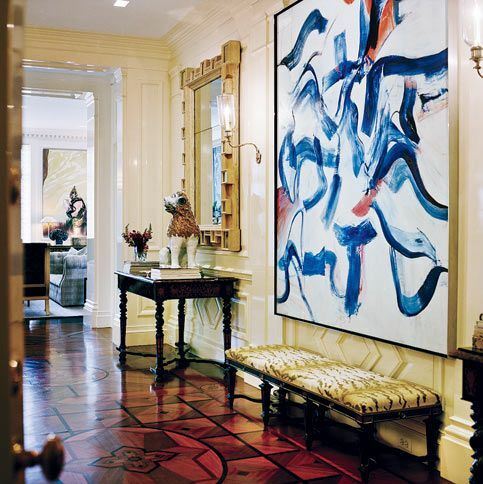 Here is a foyer, very traditional in look, but instantly energized and made current by introducing a lyrical, expressive work by de Kooning. We won’t talk about how much I want to sneak into that apartment and steal that painting and then try and run away with it tucked under my arm. But again, notice how its scale is at once arresting, unexpected and still completely composed and curated. Brilliant. That’s about it for now. But take another look at some more spaces with wonderfully over-scaled artwork. 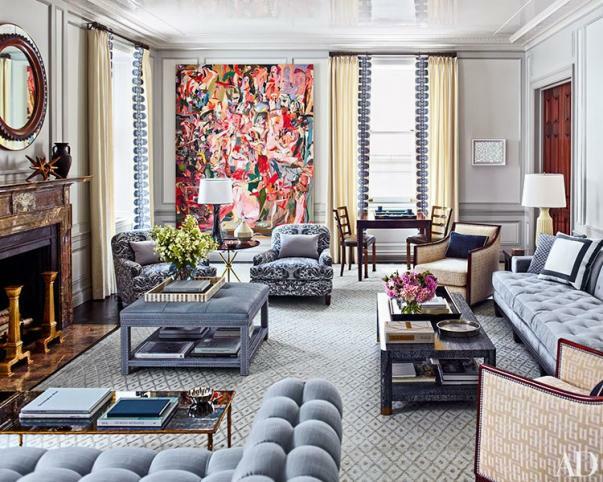 Notice how the proportion of the art somehow manages to be both center-stage and also complement the rooms’ furnishings. Melts my heart. Cheers! 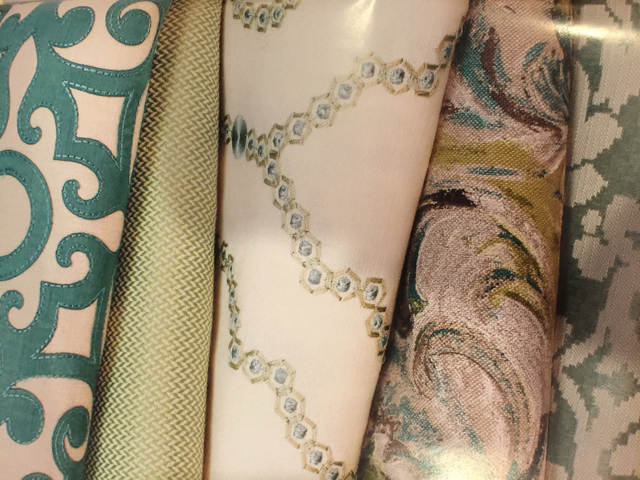 I consider myself very fortunate for the opportunity to work with clients that appreciate and understand the importance of textiles in a design project. 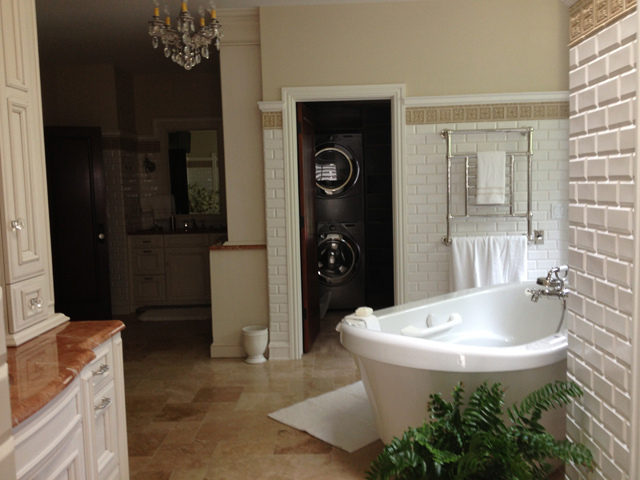 I have been working with such a client for the last nine months to recreate the beauty and grandeur of her family’s 150-year-old plantation home. 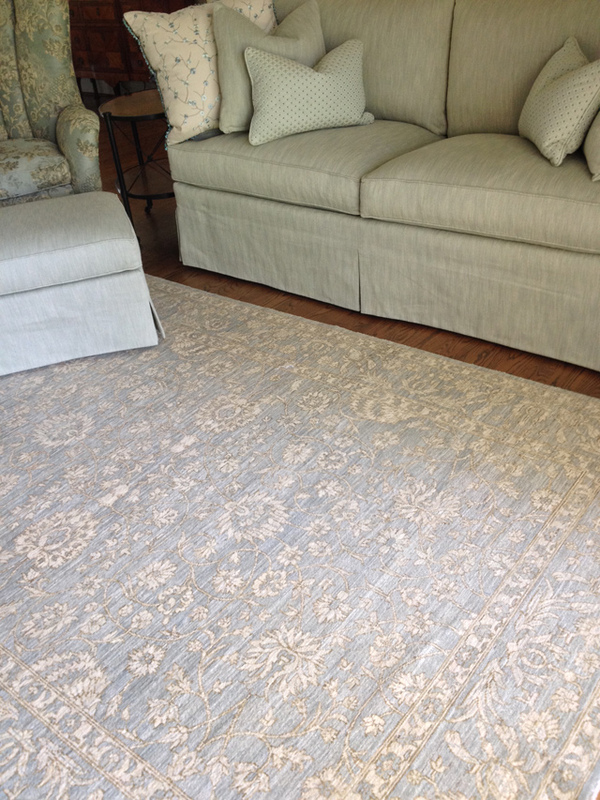 We started with a concept that was worked around a custom wool carpet in the Drawing room in a very soft sage green. 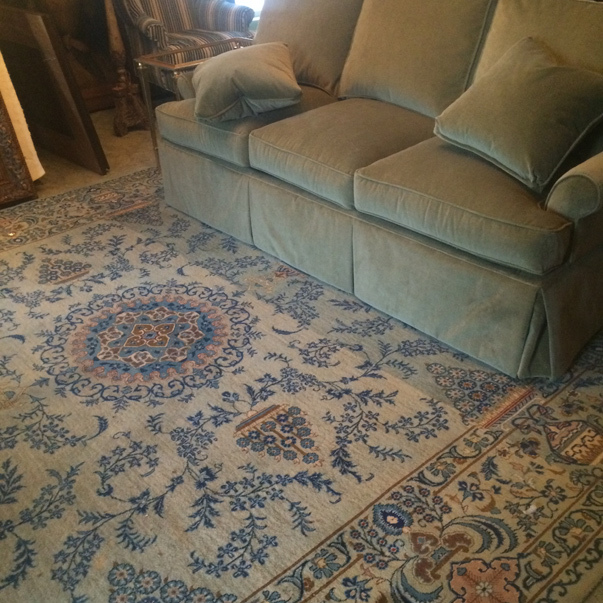 The carpet was in excellent condition so we simply “wrapped” the room in a custom paint color of the same hue. 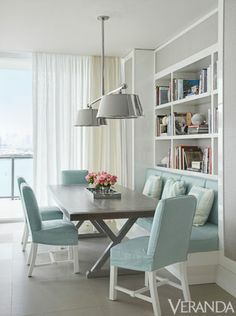 We painted trim, bookshelves, and ceiling with tones of this green to make a luxurious palette from which to build. 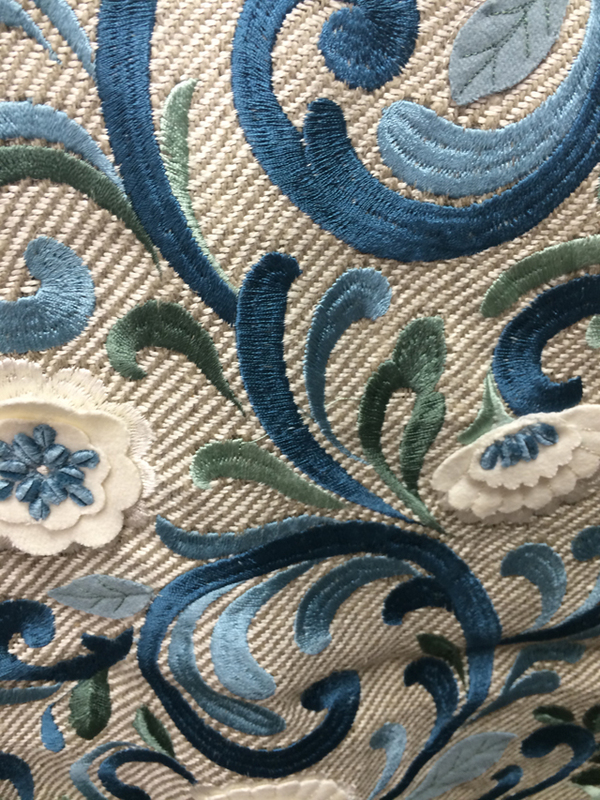 We then found a FABULOUS silk damask by the GREAT Oscar de la Renta for Lee Jofa in a deep teal color with an embroidered design of a semi-traditional, over-scaled pattern. 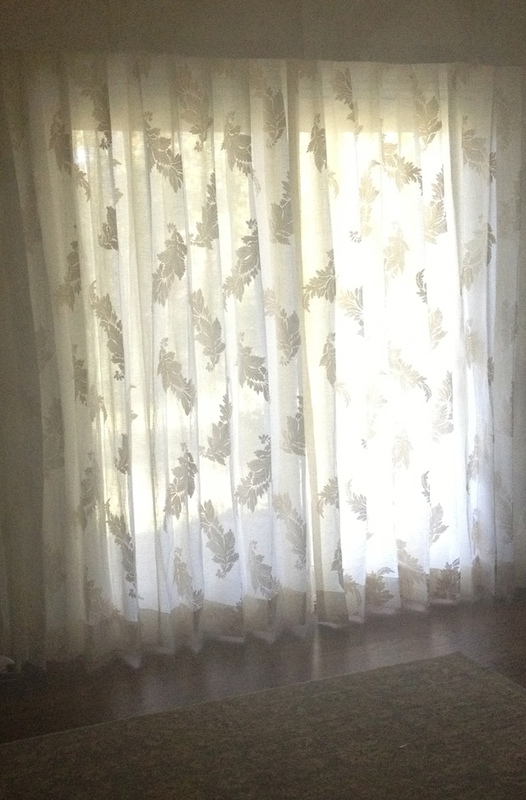 This was to be our jumping off point to create beautiful window treatments that we would install 12″ above the actual window height to give the appearance of larger more prominent views. 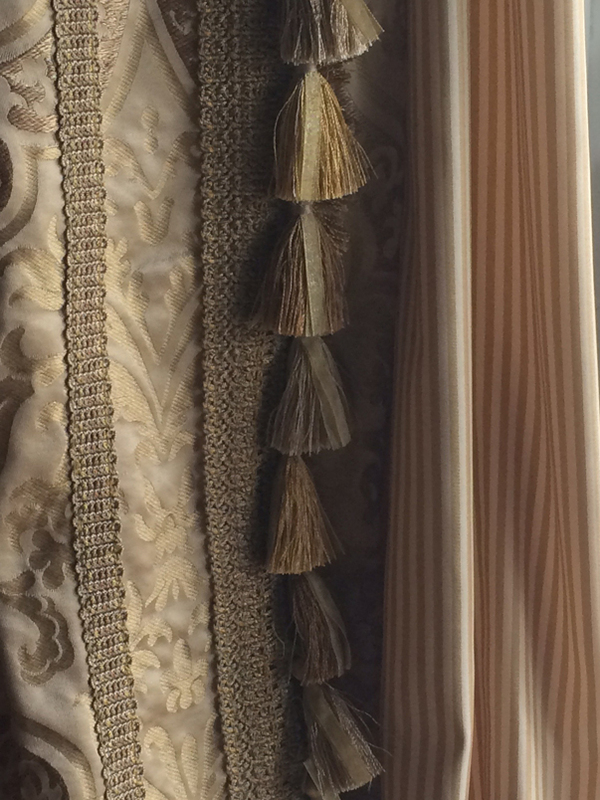 From there we simply added luxury by layering patterns and textures to complete the “Gone with the Wind” feel. 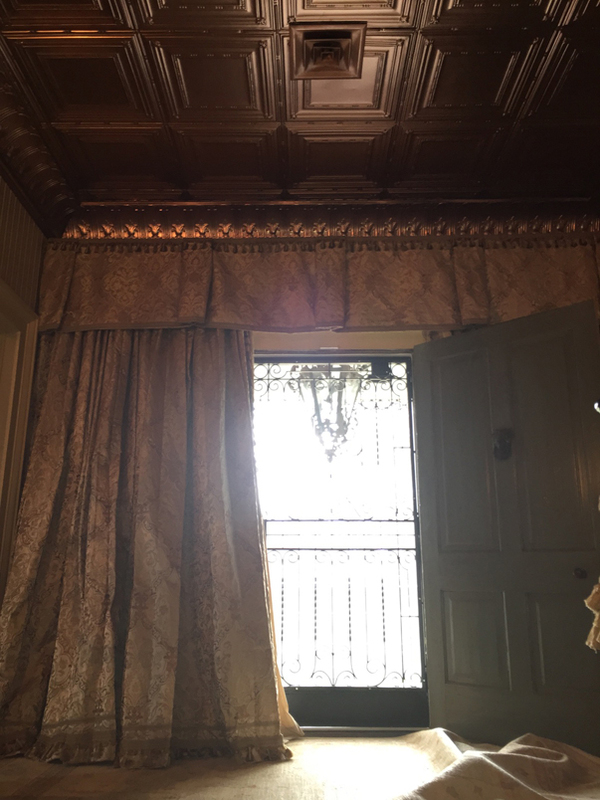 We discussed that by pulling the draperies all the way to below the crown molding and adding a beautifully crafted top treatment the windows became our main point of visual interest. 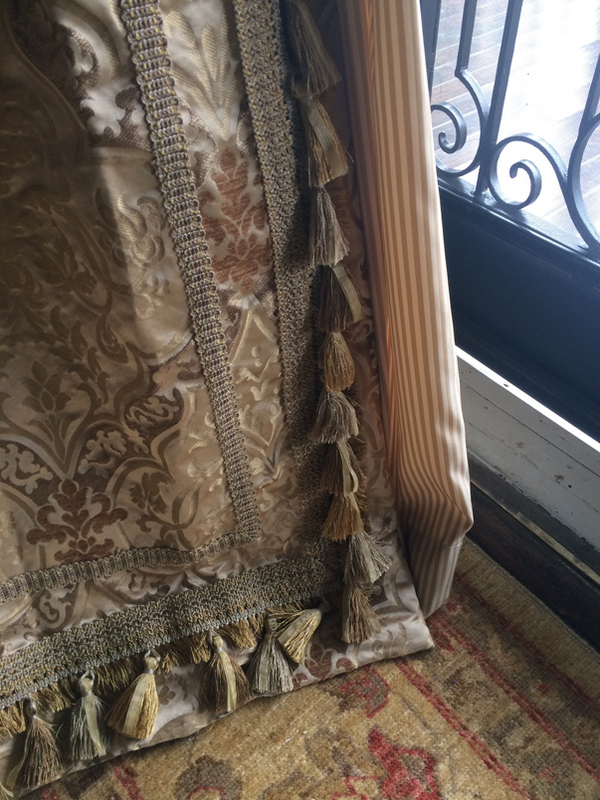 We billowed the fullness of draperies by using three widths of fabric per panel and added drama with a 3″ puddle. 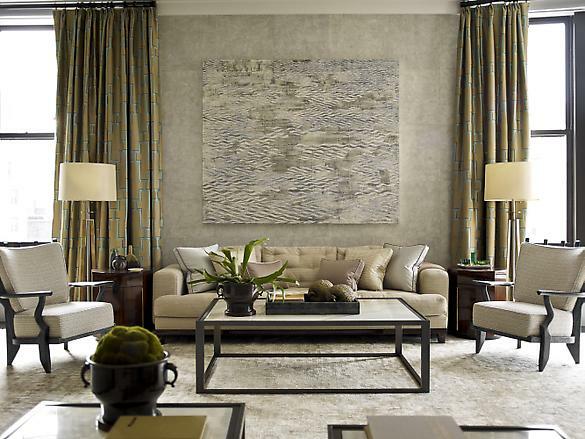 All of the textiles we used in this drawing room were painstakingly thought through, so as to build on the luxury of the space. Stay tuned next month for more on this project! Plaid makes an instant statement! 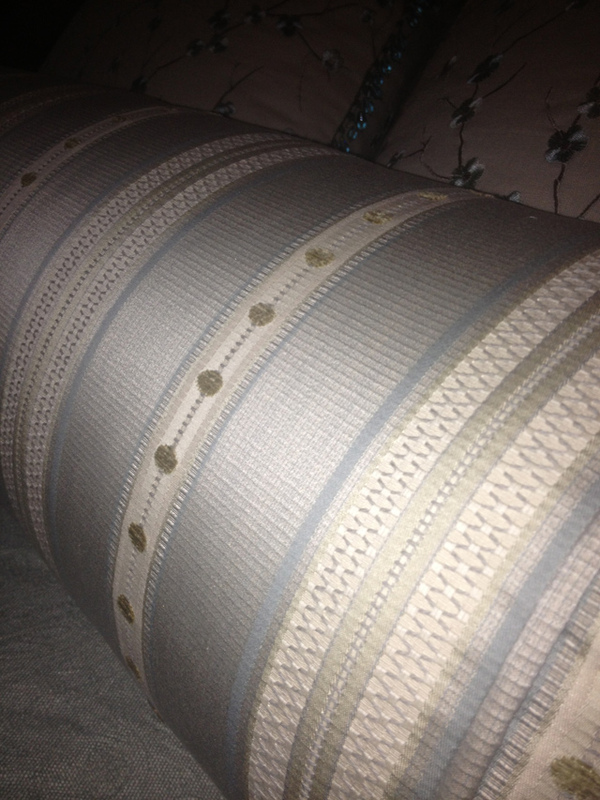 When combining textiles for design projects I always try to add a plaid or a modern geometric into the mix. 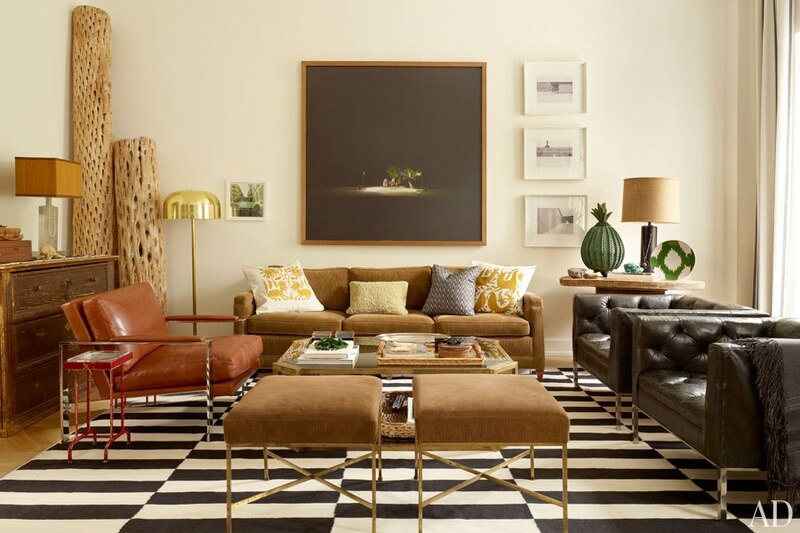 Whether it be a large, over-scale buffalo plaid or a simple check it merely adds that multi-dimentional effect that we all strive for in our spaces. Many times used for draperies or custom bedding treatments, a plaid can act as a “neutral” pattern with an added touch of sophistication. 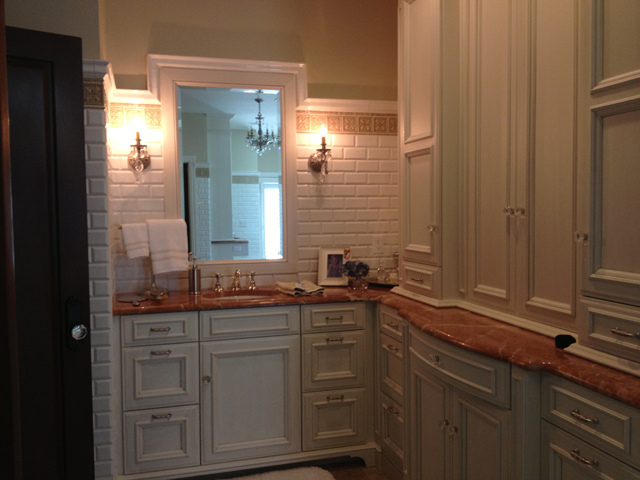 It is a pattern that’s especially popular in any environment that leans towards the influences of French or Country French. 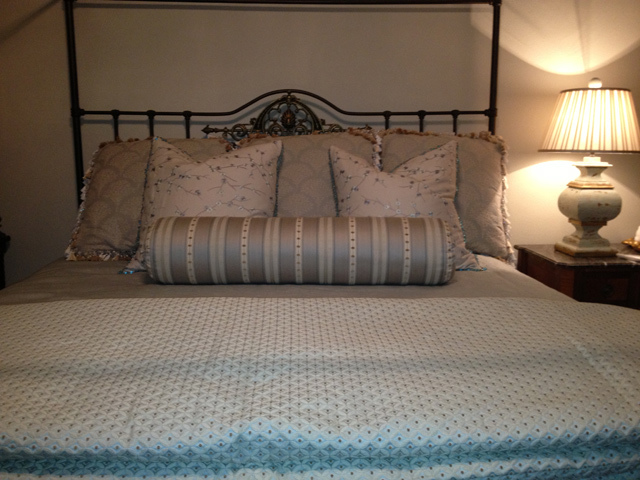 These types of patterns can often be mixed in a dual application to further deepen the visual interest. 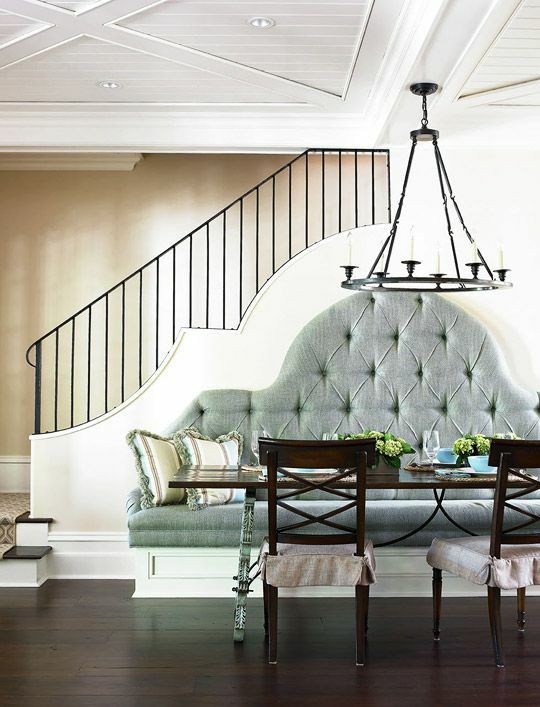 Often found in less heavy textiles such as silk, linen, and Madras, plaid will add an “airy” and clean feel, adapting to almost any fabrication. 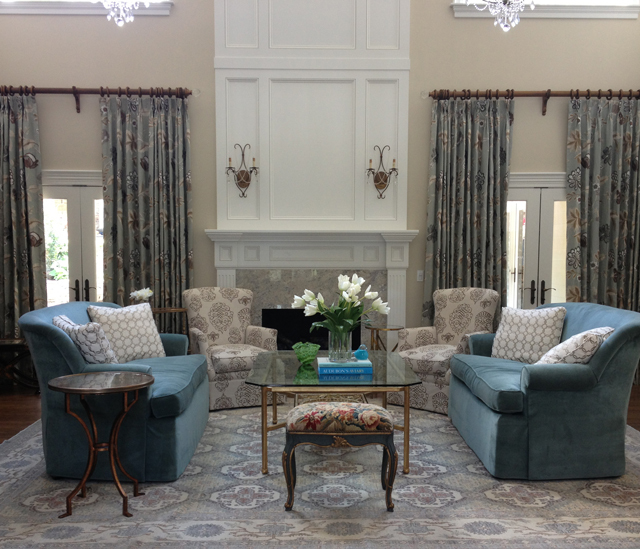 For a warm and cozy feel, plaid is often successfully applied to upholstered pieces in a den or living room. 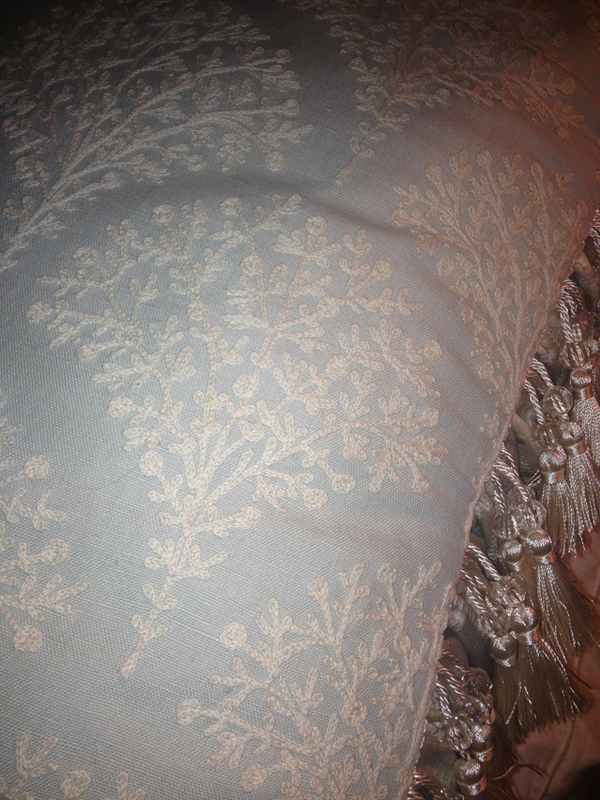 Cotton or heavy linen is the preferred choice to achieve this “loose” or casual atmosphere. Explore the possibility of a plaid or check when pondering your next design project and I can guarantee a deeper appreciation for textiles! 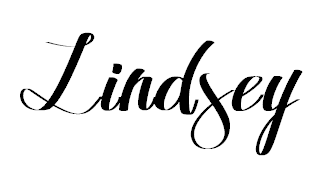 Kelli Wilson is the creative mind behind Kelli Wilson Consulting. She is the resident designer at Designer Effects, a to-the-trade fabric showroom located in Little Rock.